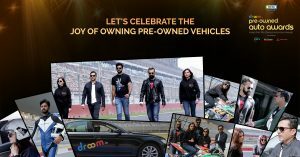 Droom is India’s fastest online auto marketplace to buy and sell new and used automobiles, is here with India’s First Pre-owned Automotive Awards. The awards are organized in New Delhi on 11th December 2018, to celebrate the success and growth of used vehicles. They are broadly bifurcated into four categories namely, the Jury’s choice, Buyer’s choice, Dealer’s choice and Best of Droom. The jury constitutes of the most impactful personalities from the automobile industry. Neharika Yadav is India’s fastest lady Super biker, Garima Avtar is an eminent Rally Racer, Jagdish Khattar is Former Managing Director of Maruti Udyog Limited, Sundeep Gajjar is the CEO, Editor & Chief Photographer for xBhp, Yudhishtar Urs is an Actor & Television presenter and Faisal Khan- CEO Motor Beam. The jurors have picked the most distinguished features that a customer expects from a pre-owned vehicle. This includes the SUV of the year, hatchback of the year, sedan of the year, MPV of the year, scooter of the year, luxury SUV of the year, luxury sedan of the year, electric scooter of the year, compact SUV of the year, sports motorcycle of the year (above 500cc), sports motorcycle of the year (below 500cc), cruiser motorcycle of the year (above 500cc) and cruiser motorcycle of the year (below 500cc). Taking into consideration, the buyer prospective and selection in different scenarios for a pre-owned vehicle. The nomination bracket is for the category of buyer’s choice hatchback of the year, buyer’s choice sedan of the year, buyer’s choice SUV of the year, buyer’s choice premium car of the year, buyer’s choice bike of the year, buyer’s choice premium bike of the year and buyer’s choice scooter of the year. The dealer is playing an impactful role in shaping and uplifting the used vehicle market. Thus, we have a special nomination for the dealer’s community with the dealer’s choice hatchback of the year, dealer’s choice sedan of the year, dealer’s choice SUV of the year, dealer’s choice premium car of the year, dealer’s choice bike of the year, dealer’s choice premium bike of the year and dealer’s choice scooter of the year. Our team went through in-depth research and analysis to determine the reward quotient for different categories. This includes the awards for the lowest total cost of ownership – car, lowest total cost of ownership – motorcycle, lowest total cost of ownership – scooter, most sold car on Droom, most sold motorcycle on Droom, most sold scooter on Droom, most sold EV on Droom – 2 wheeler, OBV resale value car of the year, OBV resale value motorcycle of the year, OBV resale value scooter of the year, most sold EV on Droom – 4 wheeler, best rated car on Droom, best rated motorcycle of the year and best rated scooter of the year. So, log onto Droom Auto Awards (https://droom.in/auto-awards/nominees), Vote for best vehicle and stand a chance to get an invite for India’s First Pre-owned Auto Awards. This event will set a breakthrough in the used auto industry. This is a nice initiative and wish your team “All the Best” for this grand event. These awards would increase the competition among the pre-owned automobiles. Foreign countries do have such awards on regular basis. But this is the first time, such an event is organized in India for fastest growing used automotive sector. The concept sounds good to reward the used vehicle segment in India.